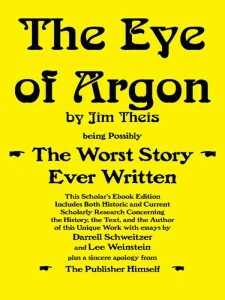 Home / Downloads / The Eye of Argon — Free and No-so-free Download! 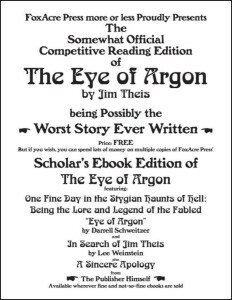 Here it is — the legendary Eye of Argon, available in two editions. Click on the cover images to learn more. The Free Somewhat Competitive Reading Edition contains the complete text of this timeless work, with the original typing, layout, margins and stunningly bad illustrations all reproduced from its first fanzine publication. It must be seen to be believed. PDF only, as the whole point is reproduction of the original pages, and that’s what PDF is for. In the Scholar’s Ebook Edition, the complete text likewise appears — along with three essays (by Darrell Schweitzer, Lee Weinstein, and Roger MacBride Allen) discussing the history, folklore, and Deep Inner Meaning of the staple holes. No, we’re not kidding about the staple holes.